Found a solution, with kudos to Adam Larsen. We are having the same experience. Have you discovered a fix? The posted fix worked for us!! Thank you very much. Our schools like this report. Schools would like to have Date Range parameter added to the report to shorten the list of assignments that is displayed. Has anyone made this addition to this report and will you share? We have upgrade PowerSchool to 10.1.1 and are having issues pulling and displaying terms in verification. We are using version 4.1.1 and it worked fine until we upgraded to 10.1.1. Help! Is anyone else having this issue? Is there a work around or customization I can do? Thank you for any help! Our school is on Power Teacher Pro, the high school uses the Class Grades report all the time. They have found that not all Power Teacher Pro sections are displaying. Any clue as to what may be causing this? unchecked Pause - This student only shows one of their classes with the C. the other three classes do not show. The class shows for other students so it isn't a course issue. I just can't figure out why it isn't showing for this student. There are other students that this is happening to. I just saw Adam's fix, I just fixed it and now it works. Is there a Class Grades report version for PTP? Or does it only run for PTG. Hi, the Final Grade Setup report is not pulling accurate data for teachers on PT Pro. Has anyone found a fix? The report would need to be completely rewritten, since the schema is different. 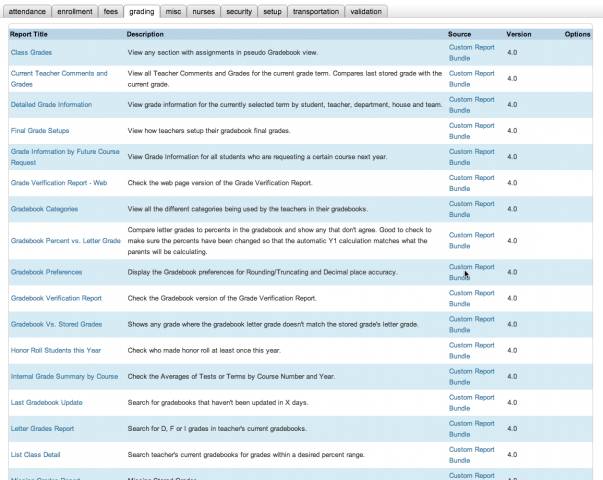 Will you be updating any of the gradebook reports for PTPro? I would love the Final Grades Setup, if possible. I'm not able to download the file. I've checked all my network settings, cleared cache and cookies, used different browsers and different computers, but I keep getting a network error. Any suggestions or has anyone else had this problem? Just wondering if there will be an update coming out for this bundle? The gradebook assignment status report does not work with PowerTeacher Pro anymore. I'm assuming a number of the reports may not work with PT Pro. I am wondering, too. I'm not finding another report that will pull missing assignments from PowerTeacher Pro as a report for all students. For those of you who've used this custom Grades reporting before and have now switched to PowerTeacher Pro- is it total incompatibility or are there just certain features no longer working? I'm having trouble with the download anyway and am wondering if I should just try a different path for now. Thanks! Didn't realize I already posted, but still interested in PTP versions of these reports. Hi, Is there a way to set the "letter grades report" to use E's rather than F's? Will the Letter Grades Report be updated to be used with PowerTeacher Pro? Or will another report be created to tell when the last update to grades was made by teachers? 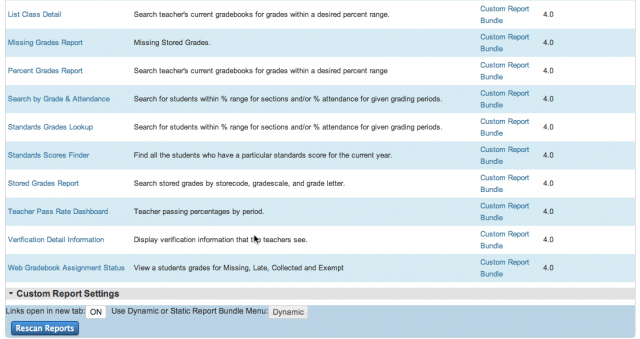 Will the Grading bundle be updated to work with PowerTeacher Pro?? Thanks. Hi, I too am missing (emotionally, not physically!) some of the features that we were able to use before we upgraded to PowerTeacher Pro. Are there plans to upgrade the plugin to work with PT Pro? Thanks so much for all you've provided PowerSchool users over the years! It appears that when using PowerTeacher Pro, the Class Grading report no longer works. Can this be reviewed and updated to work with PTP? When I uncheck the Pause box, I am only getting a response of "Searching for your results". I am on PS 10.1.3 and using PTP. Anybody have any thoughts? The Grades Report is not working for me. I select S1 as my store code and it returns "No data available in table:. I am on PS 11.0.2. Thank you for any help you can provide. The final grades setup report appears to omit any records where the weighting is set to standards weighting in Powerteacher Pro instead of total points, category weights, or term weights. As this is the option we're going to school wide, it would be nice if this could be fixed. Love the reports, export buttons not there for me, something on my end? We are not able to pull the Stored Grades Report for the Grade Scales that are the "Special Scales" grading scales, and those are not options in our Grade Scales option is there a way to make this work ? I hope so - we really love this report! Student Attendance List. I am trying to run the Student Attendance List and am getting the following pop up error. Data Tables Warning (tableid='table 1') Requested unknown parameter '1' from data source for row 0. Is there a "fix" for this? I installed the Grading Bundle but don't see all reports. Only the following are shown: Gradebook Preferences, Graduation Statistics, Honor Roll Students this Year, and Internal Grade Summary by Course. Please advise. Thank you. Try using the PSCB - Custom Reports (Grading) bundle as an alternative.